I was treated to this GORGEOUS handmade custom whittling knife so I can hone my wood carving skills. As you may know my main go-to knife is also a Rhode knives custom and coincidentally was also a gift from my mother (I know right, best mom in the world or what?). That knife is called Thorn and is the most amazing quality knife, this one is no different! 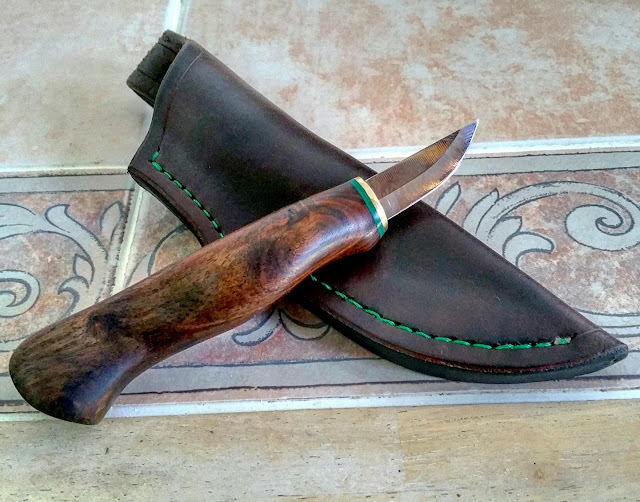 It has a stainless blade and English walnut handle with brass and green accents in the hilt that are complemented by the green stitching on the thick, quality leather sheath. It is incredibly comfortable to hold and use and I can't wait to get back into carving, it's been at least a decade since I carved anything at all so no doubt I'll be a bit rusty but that's all part of the fun. What a beautiful knife! That is great birthday gift!!! What a great gift. Serious knife envy here! Happy Birthday! It is a super cool present. Coincidentally, I have just looked up wood carving courses, I would love to be able to carve wooden spoons. When my brother and I were kids camping in The New Forest, we'd sit with our pen knives striping bark off our walking sticks. Happy days!